I'm delighted that the Peterborough branch of the MTH typo-spotting crew is growing. Today we welcome Marion H who has sent in what must be the world's first hieroglyphic instruction leaflet. 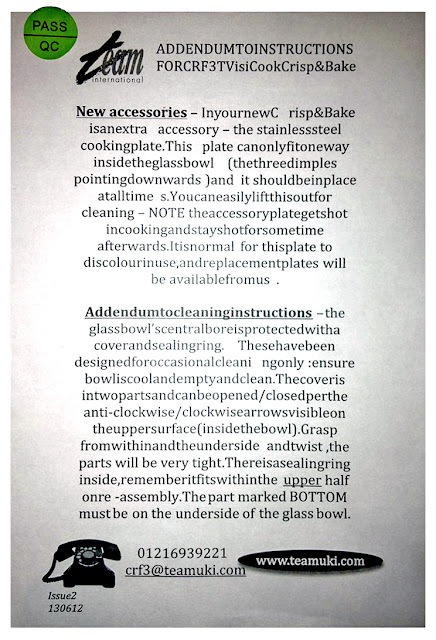 In fact, it's an addendum to the instructions for a halogen oven which suggests that it's correcting some errors in the original instructions. Well, if these are the corrections, I'd hate to see what the original looks like. Honestly, I don't know where to start. So I won't. But we can surely take a great deal of reassurance from the fact that the leaflet carries the green Quality Control Pass sticker. It's a sign of a fantastic quality standard. I do notice, however, that someone has gone to a great deal of trouble to ensure that the last sentence is the clearest part of the whole document. Yes, that one. 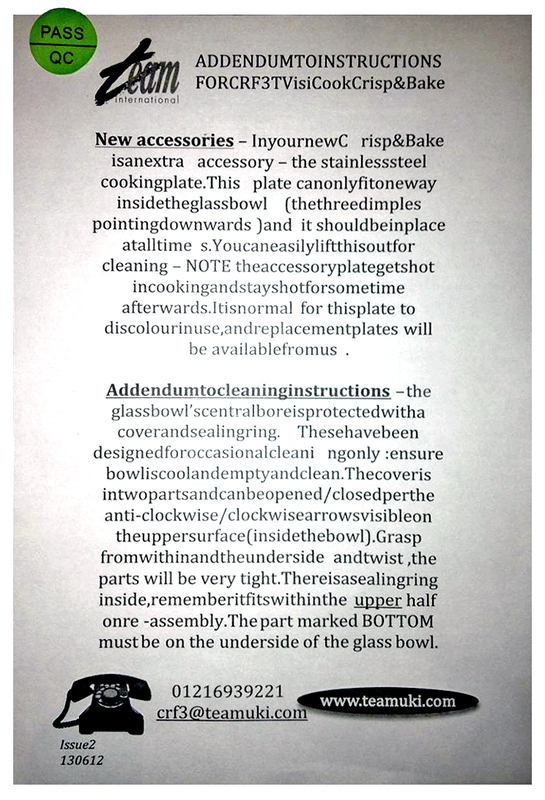 The sentence that declares the blindingly obvious instruction: that 'the part marked BOTTOM must be on the underside of the glass bowl.' Good thing that we can read that one clearly. Otherwise who'd have guessed? Incidentally, I read that Team UKI is yet another of those companies whose aim (according to its web site) is 'to provide the best of service, quality and value'. I'm wondering if that means it's offering a choice between the three? And, in which one of them it feels it has achieved that aim with this leaflet. I guess the document has been written by a Halogenic Oven Specialist. But it reads as though it's been written by a Hallucinogenic Oven Specialist.